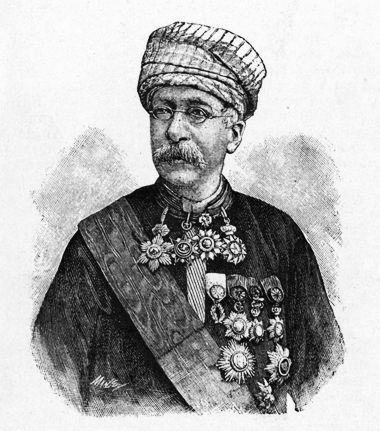 Defined as “the father of the modern Egyptian theatre,” James Sanua – also known as Yaʿqūb Ṣannūʿ and later Abou Naddara, the man with the glasses, as a satirical journalist – was born in Cairo on February 9, 1839. He was the last child of Sarah, an Egyptian Jewish woman, and Raphael Sanua, an immigrant Italian Jew from Leghorn who had become an adviser to Prince Ahmad Pasha Yeken. Because of his multicultural upbringing, by the time James was twelve he spoke Arabic, Hebrew, Italian, French, and English. Between 1852 and 1855 Sanua was sent to Leghorn to continue his studies at the Prince’s expense. Most of the studies on Sanua as playwright focus mainly on his works in Arabic that led to the founding and management of a theatre company in Cairo between 1870 and 1872. In these accounts of his short-lived playwriting career, references to Sanua’s production in Italian remain extremely vague, with no tangible proof of the plays’ existence. Finally, in 2015 Egyptian scholar Wafaa El Beih published an edition of Il marito infedele drawing from a scanned copy of the lost original, printed in 1876 by the Typographie Jules Barbier and subsequently held at the National Library, both in Cairo. This is the first concrete proof of Sanua’s theatrical production in his father’s native tongue and the following is the first translation into English based on this latest discovery. Hall of the Four Nations Hotel, well furnished with a door US and four on the sides that lead to guest rooms. TAMB: Le Monsieur Anglais the Anglish sir qui has arrived at noon, has he sorti ou not? MUST: Tha Ingliz mista with the big big beard like a brooma, he’s still in his rooma.TAMB: He mangé in his room, ou à Table d’Hôte downstairs? MUST: He has done eading inside tha rooma and eaten khamse beefsteaks (opening his hand and showing his thumb and fingers to Mme Tamburon), vife beefsteaks, cinco, undersdand madame? MUST: Tha English mista, bery handsome man, stronga like a saldier. Ah! If I can sbeak Ingliz, I get a big baksheesh, but he sbeaks liddle Talian, I undersdood all he said me. TAMB: Tant mieux pour toi. MUST: We Arab bery good learn the sbeaking of you foreigners. TAMB: Enough, enough; vous parlez plus qu’une femme. MUST: Now I undersdand Fransaui doo, famm means woman, not so? TAMB: Oui, oui; but go do your ouvrage. MUST: Tha train not arrive yet. TAMB: It must have occurred a malheur on the way, because now is six hours and le train must arrive at four. MUST: Allah great and Mohammed his prophet. TAMB: Va au diable, you and alls the prophets of the world. MUST: Not say so, madama, begause if Allah hearded tha words these out your mouth, he makes fall big big accidant on your head, and you dead. TAMB: Comme vous êtes embêtant. Go see if omnibus arrive with travelers. MUST: (to himself) Madama wants be left alone here begause when the Ingliz mista exit, she mage a bit tha girl with him, but she has 60 years and the face of my grandma, and the Ingliz mista wants an Arab liddle girl and not an old Frenj like madame. TAMB: Have you finished your prière to your Allah? MUST: Finished, finished, I go out (exits). BULL: Oh we don’t speak French, we speak English, Germanic, Indian and a little the tongue of Dante, the language of th’Italy. You don’t speak one of these languages? TAMB: Only un peu d’Italien. BULL: All right, all right. Is there epistles, or in vulgar language, letters for us? TAMB: (to herself) Qu’ il est drôle. (to Bull) Not sir. BULL: Then we do our outing through promenading three or four miles for exciting of appetite, and then we return here for lunch. TAMB: What do you want mangé? BULL: We eat little at night time, we don’t want to load a ship into our stomach. A soup, three, four, or five beefsteaks, one, two risotti, several ribs, a… goddam, I forget the expression in Italian. Pardon me (he pulls a small dictionary out of his pocket, in which he looks for a word). All right. I find: brain, so a brain, a pudding, cheese, 3, 4, 5, 6 bottles of English beer, and that’s enough for tonight until 11 o’clock. TAMB: (to herself) Dieu de Dieu, quel gourmand! (to Bull) At 11 what would you like mangé? TAMB: Another morceau of pudding? BULL: Oh yes, but a small bit of pudding. BULL: Bona notay, madame (ready to go). TAMB: (smiling with coquetry) Just bonne nuit? TAMB: Vous êtes very gallant. BULL: Oh yes, and you are, goddam, very old. TAMB: Thank you very much. BULL: It is nothing, nothing. (exits from the US door). TAMB: (imitating Bull’s voice) Oh yes, and you are, goddam, very old. (in her natural voice) Les hommes! Les hommes! (she throws herself into an armchair and falls into a deep meditation). MUST: (enters with two small trunks in his hands, observes Mme Tamburon and says to himself) Unhippy madam. She sboke love Mister Ingliz, but she not masmasel, she older than our laundress Ommi Zenab, who seen grate Nabolion the Frenji when come here. Unhipply madame, the Mister Ingliz perhaps sboke to her (imitates Bull’s voice) you are mother of sixty years, if you have forty years lower, we play with you tha love. TAMB: (waking up) Qui va là? MUST: (who until now has remained behind her with the two little trunks hovering over her head, is startled and strikes madame’s head with the luggage) Allah, Allah, bardon, bardon, for the life of your fader, bardon, bardon, masmasel, bardon my liddle misdress. (kneels before her) Py your beautiful eyes, bardon for boor Mustafa: I not bead your head on burbose, Allah wanded so, Allah wridden on your forhead the beading of the two trunks of tha ’Talian traveler who came now. TAMB: (furious, but laughing) You are a diable, leave these trunks here and go downstairs. Bring him here, and give him one of these three rooms. MUST: (gets up and throws the luggage aside, listlessly) Très-bien, très-bien, I bring the ’Talian sagnur, and give him tha three rooms and also this hall. TAMB: But don’t parlé with him much; because a domestique shouldn’t speak with too much familiarity with travelers. So, go and take a scandle with you, because it is now very obscure. MUST: (going out) Très-bien, très-bien, we’ll brovide a scandle, we gud servant. TAMB: Allons faire un peu de toilette (exits). Scene 4 – Mustafa and Enrico, in travel clothes. MUST: (preceding, with a lit candle) Through here, this way. Come behind me, sagnur. (not seeing well, trips over the trunks, and as he falls, drops the candlestick and puts out the candle) Allah, Allah. El Seetan catched my foots. ENR: (enters, bumps into Mustafa, and falls over him, knocking his chin on one of the trunks, then yells, stuttering) Ouch, ouch, I-I-I b-bit half my t… tongue between my t-t-teeth, g…. g… godamn this Arab. MUST: Get offa me, you’re not light, you’re heavy ’Talian sagnur. MUST: (yelling) Allah, you have brogen my bag with your vist, Mustafa dead, khalas; one more vist and Mustafa go to heaven to Mohammed. (gets up) Where tha scandle? ENR: You blind idiot, how should I know where you threw it? ENR: And I from the Occident. MUST: Yes, you to the accident. ENR: May an accident befall you and your father (pulls a matchbox from his pocket and lights a match) Fiat lux et lux fiat. MUST: Mash’allah, and you geep the fiat in tha bocket and not mag light? (looking at the floor) There’s tha scandle, light it up. ENR: I’d really like to light you up, imbecile. MUST: (lighting the candle) Tashakurat, thank you beautiful Franghi; you don’t sbeak Arabic? ENR: No, to my chagrin I’ve been in Egypt for ten years and I have no idea of a single syllable. For one it’s a devilish tongue; one should have his palate covered in zync to be able to pronounce it (making efforts with his throat) ka, kha, oha, it’s impossible. MUST: Boor man, you have signess of the jest, you need dring milk of dongey; tomorrow morning I bring here a woman dongey, and you dring a big glass, and then your jest be healed. ENR: I wish I could crush your chest with another punch, man donkey that you are; come on, show me your rooms. (to himself) I don’t know why that devil of a Levantine should have picked this inn, it looks pretty squalid. MUST: You want a room, two rooms, or three rooms? ENR: Am I supposed to take an apartment for a whole harem? (to Mustafa) I want one inside another. MUST: One inside another. For what burbose? ENR: For my own burbose (to himself) but I need to give him some reason. MUST: And you know that burbose? ENR: And you will know also. MUST: Ah good, sagnur, so yal’la sbeak. ENR: Presently a woman my relative will arrive here; a woman in Arabic garb. MUST: With her vase covered? ENR: Precisely. (to himself) This devil of an Arab is very intelligent and I can trust him. MUST: But you sboke relative, tha lady is relative means daughter of the brother of your vater, or daughter of the sister of your mutter; and how can you be ’Talian sagnur, and she lady fellahim, that is Arab? ENR: (laughing and to himself) And yet this fool is right. MUST: (smiling mischievously) Then tha woman not relative of you, then tha woman is tha friend of you. Then tha woman given plo with foot in the back of her man, then egscaped, and come with handsome ’Talian sagnur, that is you. Eh! We undersdand these tha affaire, and you want tha room within tha other to (coughs) eh! good Mustafa. We fine servant. (indicating the room SR) You enter into this room, wash tha face and tha hand, and mage bery beautiful, because tha Arab girls like much fine young men. Yal’la, go in and tomorrow tha large baksheesh for Mustafa. (picks up the trunks and, taking them with him, precedes Enrico to the room). TAMB: (enters with a lit candlestick) Par ici madame. ZEBE: (enters dressed in Arab garb, wrapped in a black silk cloak) I told you, madam, that I don’t speak French, talk to me in Arabic or Italian as you please. TAMB: Parlons Italian, because Arab I don’t understand. Donc vous voulez a room for tonight? TAMB: Et vous restez many days here? ZEBE: I couldn’t say right now. TAMB: Et vous are alone? ZEBE: Alone for the moment. TAMB: Et vous are Arab? ZEBE: I am through God’s grace. TAMB: Et vous voulez manger here or downstairs? ZEBE: I prefer to eat here. TAMB: But where your baggage? ZEBE: Your curiosity is starting to annoy me. TAMB: Pardon, madame, pardon, I won’t say another word. MUST: (to Zebeda) Mash’alla, mash’alla, ya setti. TAMB: (to Mustafa) Enough, enough, I recommend you not speak much with travelers, you take hashish and don’t know what comes out of your mouth. Have you donated a room to the Italian Monsieur? MUST: Oui, madame, and the Talian zagnur he reladive of this tha Arab masmazel, so given this tha room to setti Fatma. TAMB: (to Zebeda) Donc vous avez un parent qui? ZEBE: (following her) Thank you, thanks madam. MUST: (ecstatically, outside the room) Allah, Allah, mash’allah ya setti Fatma. TAMB: (coming out of Zebeda’s room) Allons, don’t waste your time here, vous savez that our garçon est malade, hence you must do his service. Undersdand? TAMB: (to herself) Les affaires ne vont pas mal ce soir (she starts to exit). BULL: (coming in, holds her back) To where do you put your feet in movement, gracious lordesse of my hotel? TAMB: I go to ordonné il supè for the new travelers. BULL: Who arrived? Is there Inklishmen? TAMB: No, there’s no Inklishmen, there’s an Italian monsieur and an Arab madame, but very beautiful. BULL: All right, all right. Where her room? We want see her. TAMB: But she doesn’t want see you. BULL: How do you know this? TAMB: Because the Arab madame is du Harem, and then the Italian monsieur her parent. ENR: (comes out of his room elegantly dressed and well groomed) I think I heard the voice of my friend Bull, my eccentric English friend. What the hell did he come here to do; and yet yesterday he told me nothing of his departure for Cairo, but then these sons of Albion are whimsical, it could have sufficed for me to tell him I was leaving Alexandria with the nine o’clock train, and he could have preceded me by taking the express. One thing alone I cannot explain, that is, how does he happen to be at the same hotel I chose. It must be a coincidence, but this is a pretty ugly coincidence for me, because his presence disconcerts my projects and perhaps interrupts the happy success of my adventure; it must have been the devil who wanted to put his tail in this, or more precisely, the spy angel my dear wife wanted to give me as guardian. Ah yes, I am an unfaithful husband; but what will you, when Satan presents to me the forbidden apple on the candid palm of an angelic daughter of the Nile Valley, how can one, I wonder, conquer the temptation of gluttony, thus violating the holy and sacred oaths of love and faithfulness that I pronounced as I knelt in front of the Lord’s altar, in the presence of that well-fed friar father Ambrose? Innocent I go out this morning, after delivering I don’t know how many kisses on my wife’s chaste lips. […] Parenthetically, I must remind myself that poor Carolina had misgivings of some escapade of mine; but I swore on the honor of a matchmaker of Minet-el-Bassal to not betray her and not prefer to her even the most beautiful and young queen of the world. And yet, once I had arrived at Kafr-el-Zayat I saw enter my coach a setti Zebeda, wrapped in her large habara, who, once I begged her, made me her confidant, and told me that she was fleeing the cruel treatment by her tyrant husband in order to come here to Cairo and accuse him in front of the Patriarch or Bishop. The setti Zebeda must be Levantine, raised by the modest nuns of Alexandria, so much so that she speaks our language to perfection, although with many Arabic poetic tropes. She told me she was taking accomodation in this humble hotel, with which she meant, precede me there. I understood the invitation and here I am nicer looking and happier than on the day of my wedding; and yet I love my wife very much, and for setti Zebeda I have but a little whim, which, once I satisfy, I will be more faithful than before to my kind consort; but how can I get rid of the damn Englishman, who is very astute and clever? Love will suggest the means. BULL: (comes out of his room softly, puts himself behind Enrico and, as soon as he has uttered the last words, strikes him on the shoulders with his two hands yelling). Damnfool Henrico, you are a blagard, that is to say malandrino, in the language of Torqueto Tesso who wrote the Gerusalem delivreta. ENR: Ouch, my poor shoulders! To hell with your Torqueto Tesso and your Gerusalem delivreta, as you call it. My poor Italian language, chewed by your coccodrillo teeth. BULL: Cockodrello… I don’t understand the cockodrello. ENR: Coccodrillo is an amphibious animal that resembles you. It’s very large like you. BULL: But its teeth is as white as mine? ENR: Yes sir. (imitating his voice) Its teeth is as white as yours. BULL: All right, all right. Then I am a beautiful cockodrello. ENR: Worthy of the Museum of Natural History in Florence. But let’s leave this foolishness aside and get to serious things. BULL: I’m serious, and serious things deserve my attention. Speak, speak, I don’t want to miss a single syllable of your conversicien. Speak. ENR: Article one, first tell me the aim of your visit to Cairo. BULL: This is an affair of our heart. ENR: Are you perhaps in love? BULL: Oh yes, we are in love. ENR: Of a Cairean woman whose hand you come to ask from her parents. BULL: Goddamn no: Bull doesn’t like weddingses. ENR: And so what’s this about? BULL: (sighing) Let your handkerchief emerge from your pocket, because the narrative of our love will produce from your eyes a torrent of tears. ENR: You can tell me this tomorrow, now I am in a great hurry. BULL: We have found you due to our luck, and we not leave you tonight; you are not a bachelor like me, you have a brutiful wife. ENR: You are the brute. BULL: Oh yes, I brutiful and your wife brutiful, because of this I like her very much. BULL: (sighing) Your wife, that angel of goodness, we left in Alexandria, and you who have possession of that treasure, you mustn’t go out tonight, but stay here with Bull, listen to his stories of heartache, analyze his love and have mercy of our heart. All right. ENR: (to himself) I understand. God really put me in a bind tonight. BULL: What are you saying: are we or are we not brothers of Metastasio? Dolor… amor… cor… All right. ENR: Tell me, didn’t you drink a glass of beer? ENR: You must have drunk two. BULL: (as before) Two… no. ENR: Then three, four, or five? ENR: Then you must have stuck your beak in a barrel of beer, and you have sucked up its contents. BULL: Goddam no, I not beaked, I not content, I not sucked, I drank eight glasses to open up my apetait. ENR: Ah! You didn’t have lunch yet? BULL: No, but I ordered our dinner, thus I and you, oh no, I and you not good education, no civility, no courtesy, one must say “you and I.” Hence, you and I will eat together in this evening, and will eat in this large lobby. Did you understand? ENR: Unfortunately I understand: but I am sorry to not be able to accept your kind proposal. BULL: And the reason of your non acceptance what is it? ENR: (to himself) One should be able to think of something in the moment. BULL: Why are you silent? Make the opening of your heart, release the outpouring of your pain, and talk about your love. Cor… dolor… amor… All right. ENR: How poetic. (to himself) God send him an accident and also one to whoever taught him Italian. BULL: So the reason of your non acceptance, what is it? ENR: (to himself) I have it. (to Bull) Give me your word as an Englishman, and I’ll confide to you a little secret. BULL: (beating his chest) Mister Edward Joseph William Bull is an honorable gentleman. The English proverb says: the secret of our friend is not our property. Therefore, speak. ENR: Do you know the Levantine merchant Selim, who has his market stand on the Sherif-Pasha street? BULL: Oh yes, Khawaga Selim is our friend. ENR: Do you know his daughter? BULL: Oh yes, I know her very well; she speaks English. ENR: But the cousin, you don’t know her? BULL: Cousin of hers or his? BULL: I know her too, but the cousin of his I don’t know. ENR: So it is his cousin. Khawaga Selim, whom I met this morning at the station, asked me to accompany her and lead her here to an old aunt of hers, where she needs to meet a nice young man, who wants to make her his wife; but in my hurry this morning, I forgot to ask him where this aunt lives. BULL: This perhaps the young lady will know. ENR: Had she known it, I would have taken her there. BULL: And so what did you do? ENR: I got her a room here near me for this night, and tomorrow I’ll get information about her aunt’s house, to which I will accompany her myself. BULL: What a nice combinization. ENR: (to himself) Let’s hear this too. ENR: (to himself) Once again, the dolore, amore and core. ENR: Has nothing at all to do with the cousin of Khawaga Selim. BULL: There’s a great, a very much relationship. ENR: (to himself) I see that we’ll never be done tonight. (to Bull) Explain yourself, but be quick for god’s sake. BULL: I had a Franj girlfriend; she lived with me three years, then she made love with a Franj engineer, and in his company she made her escape here. ENR: And left you in the lurch. BULL: She did not leave me any lurch, I lurched from love to pain because I loved her like our Queen; but now I come here to blow open her head and her lover’s head with this resolver (extracts from his pocket a revolver and sticks it in Enrico’s temple) Like this, understand? ENR: (stepping back) Hey, hey, slow down with guns, mister Englishman. BULL: But now, (putting the revolver into his pocket) but now I won’t blow open their head, I will treat them with disdain. BULL: But I want a favor from you. BULL: Let me be introduced to this Levantine milady before she sees that young man who wants her as his wife, so I marry her and vexare my damn lover, who has made betrayal to me. Understood? In the meantime we go downstairs, order big dinner for you, her, and me with beefteck, brandy, and champagne. (strikes him on the shoulders and exits). ENR: As I said, it’s written in the eternal books of destiny that I must be for tonight the victim of this original of an Englishman. Indeed Mr. Bull has always been my albatross. Yesterday evening, as he was at my place for dinner, on top of consuming all the dishes and draining all the bottles, he didn’t refrain from being gallant with my young wife, and he also took the liberty of talking to her sotto voce, now and then glancing at me meaningfully. I was on the verge of becoming furious, but civility forced me to calm down, civility I say, and not the fear of getting into a punching match. The fact is that tonight he slows me down and there’s no way to get rid of him, even if I thought I had found a good device by making up that magnificent little story of the cousin of his, since my dear Bull knew the cousin of hers. Now I wonder what I have to do to persuade her to come to dinner with us? She, who didn’t want to uncover her face in front of me, I can’t imagine how she’ll want to in front of that English sailor. Yes, sailor, because before becoming a cotton merchant, our friend was a ship captain. Waves of the sea! Why didn’t you unleash yourselves against the armored frigate that Bull commanded? or you furious tempests why didn’t you push his bark against some solid rock that would have shattered it, and our unfortunate captain would have been bait for the fish? But I waste time here chit chatting instead of finding a remedy to get me out of my predicament. (he thinks). Let’s try. There’s no harm in trying, says the proverb. (knocks on the door of setti Zebeda) Setti Zebeda, please, I am alone. ZEBE: (from inside, changing her voice) I thank you sir, I have overheard everything and I have my good reasons to not come out. If that Englishman saw me he would recognize me. ENR: But you can appear with your tarrha, with your chaste veil, and then I dare him to recognize you. ZEBE: Well, then I want to satisfy, sir. ENR: Good, and I will be grateful to you for such a great favor. ZEBE: (comes out with the tarrha over her face in the Turkish manner, i.e., so that only the tip of the nose can be seen) But Mr. Bull can show up any moment, therefore excuse me if I keep myself covered. ENR: Do as you please. So you know that troublesome Englishman? ZEBE: I wish I didn’t know him. You should know that he’s my husband’s boss. ENR: You are then the wife of Khawaga Antun, mister Bull’s agent in Kafr-el-Zayat? ZEBE: I am indeed her, and the boss frequently had lunch at our home, when he came to do accounting with my husband, and sometimes he even annoyed me with his advances. ENR: Indeed he woos all women. ZEBE: And doesn’t know how unpleasant he is. ZEBE: He has, as we say in Arabic, the blood of an insect. ZEBE: If his mother had given birth to two like him, that would be enough to change the gaity of our country into irritation. ENR: What sweet expressions! What wit! ZEBE: He is so heavy that the soil groans under his tread. ENR: Adorable woman! Egyptian muse! ZEBE: Shhhh, I can hear someone coming in this direction. ENR: (stomping his feet) That damn bull. I would give two years of my life to whoever would bring me the news that he was struck by apoplexy. MUST: (comes in bringing plates, silverware, tablecloths, and napkins which he lays on the table) Evening good, sars. Evening like milk ia setti. Mash’allah. You are tha houria of the Azbakiyya of God. ZEBE: (smiling to Enrico) I am proud of my homeland, since even the common man is a poet. ENR: Indeed yes! The oriental has a gracious and figurative language. MUST: (to Enrico) So I brebare here tha table for tha eatinga of yous and of yours cuzn? ZEBE: (to Enrico) So you are waiting for a cousin of yours? ENR: For the cousin of a common friend of ours. ENR: And ask your aunt for your hand tomorrow. ZEBE: What embarrassment you have put me in, sir! I’d better go back into my room and have dinner alone. ENR: No for the love of God, stay here, I pray you. Although our friendship is but a few hours old, it has transformed into an ardent passion. ZEBE: (looking US) Here comes the Englishman. (she attempts to withdraw) Let me go. ENR: (holding her back) This will never be, signora; trust me. I will be able to protect you against a regiment. Stay with us and I assure you that we will have fun behind the back of that eccentric; he already has a dozen beers in his body, and with a couple of bottles mixed in, he’ll be so drunk that he’ll be a glorious spectacle. MUST: (to Bull) Not milady, she a masmasel. ENR: (to Zebeda) Signora, may I introduce Mr. Bull? BULL: Pardon, Pardon. Edward Josef William Bull. ENR: (to himself) Edward Josef William Bull, four people in one; even more than the Sacred Trinity. (aloud to Zebeda) And so I have the honor to introduce to you this noble friend of mine. ZEBE: (bowing) The honor is all mine. ZEBE: (interrupting him) The sumptuous banquet loaded with savory foods and exquisite liquors. BULL: (to Zebeda) This is the first time that we hear speak such a beautiful Italian language by an Oriental Miss. ENR: (to Bull) Egyptians have an extraordinary talent for languages. Here everyone speaks four at least. BULL: Oh yes. Even the Donkey-Boy, the boy who runs after the biuricco speaks compliments in all languages, for the sirs who mount his biuricco: English, German, Turk, French, all tongues of the world he speaks; but you (to Zebeda) Miss speak better than the Donkey-Boy; you speak Italian with elegance, and the sweetness of your parliament enters the channels of my ears, and descends little by little until it arrives at our heart. Then our heart open wide, wide, its doors, and make princely reception to this sweetness of your parliament which then makes inspiration of love warmer than the steam from an injun of a thousand horse powder. Then Edward Joseph William Bull forgets his thousand balls of cotton, his machines for shelling, his IOUs and his pounds sterling, and think only of the love of the Levantine miss. (taking her hand) Oh yes, adorable, Hanem; my chest bursts with the enflaming that your eyes kindled. The eyes are enough, because we don’t see anything else; but this ship we don’t want to see again. ZEBE: (withdrawing her hand) Signore, signore, I don’t deserve so many compliments. Please know that I am an honest lass, although poor. BULL: This persuasion we have inside our mind, we don’t make a love declaration to satisfy a whim, but to make of you, angelic Miss, our spouse, Milady Bull. ENR: (to himself) How quickly he concludes the deal, he seems to be bargaining over the sale of an item of merchandise. BULL: (to Zebeda) You remain silent? Silence is excellent sign in a love story. Latin authors say: Qui tacet, acconsentire videtur. It means in the Italian language, the one who is silent, consents. Therefore tomorrow morning Mr. Henrik accompanies me to the august home of your aunt, and we ask her for your hand. Now in the meantime we pay our respects to dinner (speaks to Mustafa who during this dialogue has not only laid the table, but served dinner exiting and coming back). Mustafa finished supé? MUST: Mash’allah, all khalas, all finished mister. Yal’la on table. A veast, veast fit for a Pasha: biftek Engliz, ribs Fransaui, rice ’Taliani, and wine German. (sotto voce to Bull) Misdress madame, sbeak you much exguses she not find six biftek, find only thalath, means three, malesh, it doesn’t matter, you ead more domorrow. ENR: (to himself) Looks like this devil of an Englishman has caught the eye of my conquest, damn him. To think that a while ago she said everything bad in the world about him: annoying, bug-blooded, and so on. And now she finds him refined, and that makes me suspicious and excites my jealousy. Never would I have thought that a transitory whim could have so much power over me, but let’s hasten to take a seat, otherwise we’ll be left with our body still hungry. Bull is a famous gourmet. (sits near Zebeda and says to her:) So how do you like your future? ZEBE: (to Enrico) Let’s leave aside the matter of the future, since just thinking about it makes me regret it, because were I free, I assure you I wouldn’t hesitate a single instant to accept his proposal. ENR: (angrily) Then you don’t dislike him? ZEBE: (to Enrico) On the contrary I like him so much that I don’t know I could find him annoying at this time as my husband. BULL: Courtesy, civility, education, and gentlemanly manners don’t allow secrets to be spoken of when in company. ZEBE: (to Bull) You are quite right, but we don’t have secrets to exchange, we were eulogizing you. MUST: (yelling) Allah! Allah! The plate brogen tha my hand. If I don’d ged tha liddle baksheesh from tha Ingliz sar, my nose khalas, is dead. And tha muslim without tha nose serves nothing. ENR: (to himself) One just needed this imbecile and hashash of an Arab to increase my anger. (to Mustafa giving him a coin) Here, take this and shut up. MUST: (taking it) Thangs ’Talian sagnur; tha ’Talian all have good hard, tha same as tha muslim. BULL: (to Zebeda) So why make elegies for us? ZEBE: Not elegies, but eulogies, that means praises. ENR: (to himself) The four bottles have already disappeared, and I haven’t drunk anything but this one glass. BULL: (to Mustafa) Bring more brandy. We want to drink to the health of this beautiful Miss. MUST: (going out) Bronto, tha brandy for tha Mister Inglisi. ENR: (to Zebeda) I believe that if the Nile were a barrel of wine our friend would soon see the bottom of it. ZEBE: (to Enrico) Let him drink. BULL: What do you say between yourselfs? Sing my praises? ENR: (to himself) We discover in him new merits? I discover nothing but one, of being a drunkard. BULL: (to Mustafa patting his shoulder) You servant are good as English servant, and we take you in our service tomorrow morning. MUST: (happily) Yes, goddamn. All right bladel-ful, Mister Bull. Donkey-boy English man, yankydudel. We sbeak Engliz like mister Shabat. ZEBE: (laughing) This devil of a Mustafa makes me burst of laughter. BULL: Thank you, thank you. ENR: To the health of setti Zebeda. ZEBE: Thank you, much obliged. BULL: (with oratorial thunder) God, God, save our Queen Victoria. ENR: (to himself) What does the Queen have to do with this? BULL: (as above) God, save all the warships of Great Britain, all commercial ships with all cotton and merchandize inside. ENR: (to Zebeda) After cotton and merchandise, let’s hope you’ll come next, signora. ENR: (to himself) I would pay a hundred lire to be able to get rid of him. ZEBE: (to Bull) Sir, I am not used to drinking so much and the little I drank starts making my head spin, so allow me to withdraw. ENR: (to himself) Very good expedient, so he too will go to bed and I’ll be master of the field. (to Mr. Bull) Mr. Bull, it’s already late, it’s nearly eleven, and we must go lie down soon to get up early tomorrow. BULL: And go to the aunt of Miss Zebeda. But we want to have half an hour of entertainment, for example, singing, making music, dancing. MUST: You vant to dance. I pring tha music of the Naboledan with the guitarra large and the biolin. BULL: All right. Go fetch the music right away. (sotto voce to Mustafa) Tell your lady to come here to dance with Mr. Henrik, you understand? BULL: (stroking his hands) Big party! Magnificent amusyment. ENR: (to Zebeda) But this crazy man Bull will make us make a scandal at the hotel. ZEBE: (to Enrico) For myself, I don’t see any scandal. This hallway belongs to us with all the rooms that are in it. ENR: (as above) But your husband, signora, your aunt, the Patriarch, the Bishop, and the separation? ZEBE: (as above) We’ll think about it tomorrow. For this evening, let’s enjoy ourselves and don’t let it slip out that I am a wife, or I’m lost. ZEBE: …To the Englishman, and I will accommodate you. Just let me have fun and you won’t have any cause to complain about me. BULL: (who, during this dialogue, has pretended to enjoy a little siesta on a chair, winces in fear and cries out) Goddamn, the Egyptian Miss makes matrimony with us Edward Joseph William Bull, who is a bachelor, and not with you Mr. Henrik who are married. Where’s the music? The music doesn’t arrive, why? Scene 14 – Mme Tamburon, Mustafa, two musicians with harp and violin, and the above mentioned. TAMB: (coquettishly dressed) Voila la musique. Good evening signora. And signori. (to Mustafa) Levetate the table and put the chairs aside to make piazza for dansé. TAMB: (to Bull) Demandé your dame what she wants dansé. BULL: All right (bows to Zebeda) my future milady what does your beautiful foot wish to dance? Polkas, mazurkas, valses, or Scottish? ENR: (to Bull) The signora cannot dance. ZEBE: On the contrary, I dance well but discreetly. Although I was raised by the nuns, who are horrified by theatre and dance, I learned to dance from a French lady neighbor of ours, therefore I’ll happily dance a waltz with Mr. Bull. ENR: (to himself) The more I hear her speak, the less I believe she is Arab, and the more I see her kind and affable with the Englishman, the more I feel I am suffocating from anger. ENR: (to himself) By gosh! These two don’t waste time! ; here they’re jumping around like crazy. TAMB: (to Enrico) Et vous want dansé with us? MUST: (taking Tamburon by the hand and presenting her to Enrico) Yal’la, sagnur taliani, skip with tha madame. Tha old hen make soup bery good. Yal’la. ENR: (automatically takes Tamburon and while dancing says to himself) That imbecile of an Englishman tricked me: but he’s already besotted with wine. MUST: (while the two couples dance, takes the bottles in his hand, taking a sip now from one, then from another, and – singing – says) Harray for mister Bull. harray el Bladel-ful; harray tha sagnur taliani; harray tha musicantes; harray tha madama Tamburon; harray tha shambagne good tha good; harray setti Fatma; harray tha wine; harray Mustafa tha clefer servant. BULL: (stops dancing and barely standing says) Even this hall is dancing; Mustafa dances; musicantes dance. All right. (slapping Enrico’s shoulder) You too are dancing with the beautiful Hotel madame? Bravo, bravo, viva l’amore; but enough dancing. (throwing some rupees to the musicians, which they pick up, and then they exit) Music go to sleep, you too Mustafa. MUST: I go, there’s my madame in th’house, she waid for me. ENR: (to himself) Finally we’re close to being free. TAMB: (takes Mustafa’s hand, and both going out) Bon nuit, leaf freedom to the travelers. ENR: (noticing Bull, says to himself) God be praised! (to Zebeda) Look at our friend that you found so gracious half hour ago; now he’s prey to God Bacchus. ENR: (holding her back) What, dear signora? Now that he who hampered us is snoring like a bull, now that we’re free, now that I can tell you how much I already love you, now that I’ll have the joy of looking at your unveiled face and contemplate your beauty, now you want to withdraw, and abandon me here high and dry, in the arms of the most terrible desperation? Ah!, no, this will never be, nor will your heart allow you to perform such a cruel action. Therefore stay, adorable lady, and listen to me. ZEBE: But I cannot nor should listen to you, since I’m not free; I have a husband. ENR: A husband who does not know the rare merits of his wife; a husband who, instead of adoring you, maltreats you. ZEBE: And if he didn’t act in this way with me, I wouldn’t think of separating from him. ENR: You have all the reasons in the world and that unworthy man deserves to lose such a treasure; but I, who in you recognize all the good qualities that contribute to make up the most perfect of ladies, I offer you my heart. ZEBE: (ironically) And your hand? ENR: Yes signora, (with joy) let me enjoy the view of your beautiful face, I who will shortly be your second husband. ZEBE: But Europeans are not allowed to take two wives, and you already have one; Mr. Bull told me and I know her very well; she was my schoolmate. Poor Carolina! If you were present here you’d have been horrified hearing your husband claim love and desperate love for a woman he barely knows, and whose face he never even saw. ENR: But I didn’t marry her for love. ZEBE: (with irony) Just for convenience, didn’t you? ENR: Right, just for convenience, which means that despite all her honesty and purity I cannot stand her, and I came here to Cairo precisely to establish myself far from her. ZEBE: And you wish that, once I have my separation from my husband, I become your friend? ENR: You have divined my thought. ZEBE: But once you satisfy your whim, you’ll abandon me like you’re doing now with your wife. ENR: Never; since the case here is different. You’re so beautiful! ZEBE: Your Carolina is beautiful as well. ZEBE: You are too unpleasant. ENR: I tell but the truth; Carolina is rather ugly. ZEBE: But she has two beautiful eyes. ENR: Red like bell peppers. ENR: What you will, I cannot lie. ZEBE: Signora Carolina is gracious and nice. ENR: On the contrary, she’s clumsy and heavy. ZEBE: In sum, you don’t love her. ENR: I love only you, fair-faced signora, and I pledge to be faithful to you for my whole life. ZEBE: I can’t but reward your constancy and your love for me. ENR: May you be blessed! (he takes off her tarrha, and on recognizing her, he turns away in fear, with his back to her and his face towards Bull, in whose open arms he falls, yelling) Oh God! Carolina my wife! BULL: (laughing uproariously) All right, all right! Viva, women, bravo, viva the fearless women like mylady Carolina. (to Carolina) You see that our consbiracy succeded bery well, bery well? TAMB: (who, during the dialogue between Enrico and Zebeda has remained behind the US door with Mustafa, reappears with him and, laughing, says to Zebeda) Vous deserve the corrown as the Empress of the flag-bearing women. MUST: Mash’allah mash’allah setti Fatme, not be setti Fatme, but setti Fatme be masmaselle, Taliani, non masmaselle, I erred, you madama, begause you has husband. (to Enrico, patting on his shoulders with tenderness) You boor, sagnur taliani. By God you wratched. Don’t gry, malesh, it doesn’t matter. Tha Madame forgive. CAROL. I will never forgive him. Unfaithful creature that he is; last night in the presence of Mr. Bull, he was telling me the most tender things, and I, such a fool, thought I had found in him the model of husbands, but my heart disabused me, hence this morning, following Mr. Bull’s advice, five minutes after he, kissing me and swearing faithfulness, was going out to find transportation, I went there too, and I traveled so disguised in first class up to Kafr-el-Zayat. ENR: Oh God what do I hear! BULL: (pressing him strongly to his chest) Goddamn not interruption of milady’s interesting story. ENR: Ouch! Don’t hug me so strong, you are suffocating me. BULL: (to Carolina) Go on, beautiful signora. CAROL. At Kafr-el-Zajat I got into the wagon where he was, and from that moment until now, God knows how much my poor heart has suffered. MUST: Sagnur italiani, by God, you no good. ENR: (to Bull) Intercede for me, my dear Bull, do me this grace, and I will be grateful to you all my life. BULL: (making him kneel in front of Carolina) This way, don’t move, let’s go, after me, repeat my vords. TAMB: (placing herself to Enrico’s right) Not perdé a single syllable of paroles of Mr. Bull. MUST: (placing himself behind Enrico) Sagnur taliani if you don’s sbeak tammam like tha mister Inglizi, by God not good, and your madame not want you this tha evening. BULL: Silence (after a brief pause, to Enrico) Rebeat: I Henry unfaithful, undruthful, not honorable, ask forgiveness to my spouse. ENR: I ask forgiveness from my spouse. BULL: (punching him on the shoulder) You ate half sentence: you unfaithful, undruthful, not honorable. ENR: You unfaithful, undruthful, not honorable. BULL: (punching him again) You, means I; you don’t have to say you, but you say I.
ENR: (to Bull) You are right. (to Carolina) So: I who am unfaithful, untruthful, I ask for a thousandfold forgiveness, my dear wife, and I pledge never to betray you again. Only this time, because the beautiful Arab was yourself. TAMB: This too galan. Pardon madame, pardon for him. MUST: For life your eyes beautiful, bardon for him. BULL: (to Carolina) Oh yes forgive him signora, because he got good lesson, this lesson for him enough, not needed more. CAROL. Although he does not deserve my forgiveness, yet I grant it to please you Mr. Bull, and these very kind spectators, wishing them to have the good fortune to find in their chaste and adorable spouses, wives as accommodating as me, easily forgiving their frequent escapades. Muhammad Mustafa Badawi, Early Arabic Drama (Cambridge, Cambridge University Press, 1988), 31. Ziad Fahmy, “Francophone Egyptian Nationalists, Anti-British Discourse, and European Public Opinion, 1885-1910: The Case of Mustafa Kamil and Ya’qub Sannu,’” Comparative Studies of South Asia, Africa and the Middle East 28, no. 1 (2008): 171. Sanua, James. Il marito infedele. Edited by Wafaa Raouf El Beih. Bergamo, Italy: Bergamo University Press – Sestante Edizioni, 2015. Mme Tamburon speaks a mixture of French and English: italicized is the French proper, but other words are in between, not italicized, and use an odd spelling. The same with Mustafa’s quite grammatically clunky language on top of a sonorization of consonants, e.g. p>b or t>d. Khamse is Arabic for five, this is why he shows five fingers. Arabic for “tip.” [When appropriate, we translate the footnotes of the Italian edition by Wafaa Raouf El Beih, indicated with EB]. Bull is English, who speaks Italian badly, with English interjections. In the Italian edition we find “Les hommeses! Les homme!” Since Mme Tambouron is a French native speaker this seems a typo, rather than an expressive mistake intended by the author. Finished [EB, Arabic word, spelled “calas” in the text]. How nice! [EB, Arabic word, spelled “Mashalla” in the text]. Thank you [EB, Arabic word, spelled “Cattarcherac” in the text]. Come on [EB, Arabic word, spelled “yalla” in text]. Peasant [EB, misspelled in the Italian edition as fallaha]. Oh (ya) my lady (setti). [Arabic: “Very nice, very nice, my lady.” EB. The first words spelled “Mashalla” in the Italian edition]. We skip here a couple of words that remain unclear in the Italian edition. A major industrial district in Alexandria, Egypt. A small town about half-way between Cairo and Alexandria on the railway line between those cities. Western foreigner [EB, spelled Cauaga in the Italian edition]. Thin veil that covers hair and face [EB, Spelled “Tarha” in the Italian edition]. Very beautiful divine creatures who will be the spouses of Muslims in paradise [EB, spelled “horria” in the Italian edition]. A district in central Cairo, home to a number of important urban monuments including, in the nineteenth century, Cairo’s first Opera House. It doesn’t matter. [EB, spelled “talàte” in the Italian edition]. Well [EB, spelled as “tamam” in the Italian edition]. Stefano Boselli is a New-York based theatre scholar and stage director. A doctoral candidate in Theatre and Performance at the Graduate Center of the City University of New York, he is currently Writing Across the Curriculum Fellow at City College, CUNY. He previously received a PhD in Italian at the University of Wisconsin-Madison and an MFA in stage directing from the School of Dramatic Art “Paolo Grassi” in Milan, Italy. He then specialized in acting, directing, and theatre pedagogy with Jurij Alschitz at the Russian Academy of Dramatic Arts in Moscow (former GITIS) and the National Autonomous University of Mexico (UNAM) in Mexico City. His articles about theatre, performance, translation for the stage, and dramatic theory have been published in several peer-reviewed academic journals.